In Benign Paroxysmal Positional Vertigo (BPPV) dizziness is generally thought to be due to debris which has collected within a part of the inner ear. This debris can be thought of as "ear rocks", although the formal name is "otoconia". Ear rocks are small crystals of calcium carbonate derived from a structure in the ear called the "utricle" (figure1 on right ). While the saccule also contains otoconia, they are not able to migrate into the canal system. The utricle may have been damaged by head injury, infection, or other disorder of the inner ear, or may have degenerated because of advanced age. Normal otoconia appear to have a very slow turnover, probably not fast enough to replace loss due to age or trauma. Loose otoconia are probably dissolved actively reabsorbed by the "dark cells" of the labyrinth (Lim, 1973, 1984), which are found adjacent to the utricle and the crista. BPPV is a common cause of dizziness. On average, about 1.6% of the population has BPPV each year (Neuhauser and Lempert, 2009), of whom about 0.6% had it begin that year. About 20% of all dizziness seen in medical offices is due to BPPV. BPPV can occur in children (Uneri and Turkdogan, 2003) but it is rare. BPPV is much more common in older persons, and the number of people (i.e. prevalence) in the population increases linearly with age (Froehling et al, 1991). About 50% of all dizziness in older people is due to BPPV. In one study, 9% of a group of urban dwelling elders were found to have undiagnosed BPPV (Oghalai et al., 2000). 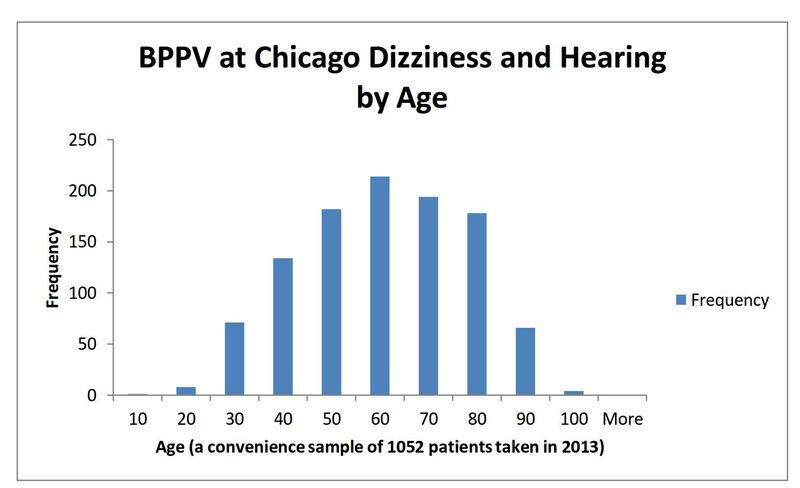 If one looks at the number of patients that are seen in dizzy clinics, the peak age for BPPV is roughly 60 (see below). This is due to a combination of the age-risk of BPPV combined with the larger number of persons in the population at certain ages. Above the age of 60, 3.4% of the population has BPPV every year (Neuhauser and Lempert, 2009). The symptoms of BPPV include dizziness or vertigo, lightheadedness, imbalance, and nausea. Activities which bring on symptoms will vary among persons, but symptoms are almost always precipitated by a change of position of the head with respect to gravity. Getting out of bed or rolling over in bed are common "problem" motions. Because people with BPPV often feel dizzy and unsteady when they tip their heads back to look up, sometimes BPPV is called "top shelf vertigo." Women with BPPV may find that the use of shampoo bowls in beauty parlors brings on symptoms. Some Yoga postures or Pilates positions are the trigger. An intermittent pattern is common. BPPV may be present for a few weeks, then stop, then come back again. BPPV is mainly encountered in persons with advancing age (Froeling et al, 1991) and in older people, the most common cause is degeneration of the vestibular system of the inner ear -- "wear and tear" involving the otoliths. In these cases, BPPV is called "idiopathic", but nevertheless the general opinion is that it is usually due to degeneration. The most common cause of BPPV in people under age 50 is head injury. The head injury need not be that direct - -even whiplash injuries have a substantial incidence of BPPV (Dispenza et al, 2011). Between 8% and 20% of BPPV is attributed to trauma. While one does not usually think of surgery as trauma, nevertheless BPPV can follow surgery, including dental work, where the cause is felt to be a combination of a prolonged period of supine positioning with vibration from drilling, or after surgery to the inner ear (Atacan et al 2001).The resolution rate of BPPV due to trauma and nontraumatic BPPV is similar (Aron et al, 2015). There is also a strong association of BPPV with migraine (Ishiyama et al, 2000). Viruses affecting the ear such as those causing vestibular neuritis and Meniere's disease are significant causes (Batatsouras et al, 2012). While gentamicin toxicity as a cause is rarely encountered, BPPV is common in persons who have been treated with ototoxic medications such as gentamicin (Black et al, 2004).Other causes of positional symptoms are discussed here. A physician can make the diagnosis based on history, findings on physical examination, and the results of vestibular and auditory tests. Often, the diagnosis can be made with history and physical examination alone. The figure to the right illustrates the Dix-Hallpike test. In this test, a person is brought from sitting to a supine position, with the head turned 45 degrees to one side and extended about 20 degrees backward. 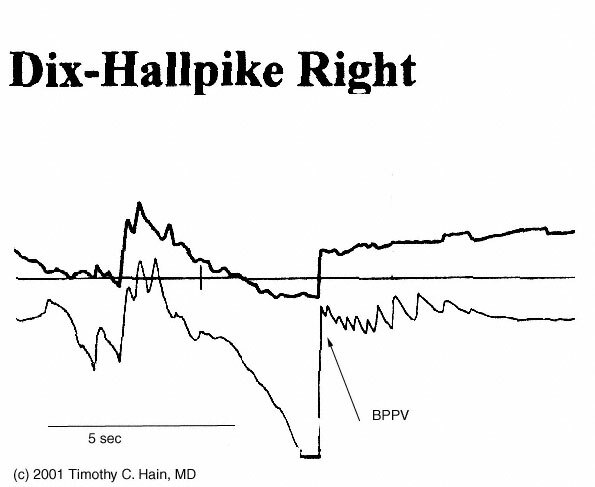 A positive Dix-Hallpike tests consists of a burst of nystagmus (jumping of the eyes). The eyes jump upward as well as twist so that the top part of the eye jumps toward the down side. Click here to see a movie of BPPV nystagmus. (13 meg download) -- it takes about 10 seconds to get going. The test for BPPV can be made more sensitive by having the patient wear Frenzel goggles or a video goggle. Most doctors and physical therapists that specialize in seeing dizzy patients have these in their office. With respect to history, the key observation is that dizziness is triggered by lying down, or on rolling over in bed. Most other conditions that have positional dizziness get worse on standing rather than lying down (e.g. orthostatic hypotension). There are some conditions that have symptoms that resemble BPPV. Patients with certain types of central vertigo caused by cerebellar injuries can have similar symptoms. Patients with migraine associated vertigo can also sometimes show eye movements resembling bilateral BPPV. Electronystagmography (ENG) testing may be needed to look for the characteristic nystagmus (jumping of the eyes) induced by the Dix-Hallpike test (also see here PC BPPV). For diagnosis of BPPV with laboratory tests, it is important to have the ENG test done by a laboratory that can measure vertical eye movements. A magnetic resonance imaging (MRI) scan will be performed if a stroke or brain tumor is suspected. A rotatory chair test may be used for difficult diagnostic problems. It is possible but uncommon (5%) to have BPPV in both ears (bilateral BPPV). BPPV has often been described as "self-limiting" because symptoms often subside or disappear within 1-2 months of onset (Imai et al, 2005). BPPV is not life-threatening. One can certainly opt to just wait it out. If you decide to wait it out, certain modifications in your daily activities may be necessary to cope with your dizziness. Use two or more pillows at night. Avoid sleeping on the "bad" side. In the morning, get up slowly and sit on the edge of the bed for a minute. Avoid bending down to pick up things, and extending the head, such as to get something out of a cabinet. Be careful when at the dentist's office, the beauty parlor when lying back having ones hair washed, when participating in sports activities and when you are lying flat on your back. Similarly be cautious with chiropractic treatments that may jostle the head. Symptoms tend to wax and wane. Motion sickness medications are sometimes helpful in controlling the nausea associated with BPPV but are otherwise rarely beneficial. As BPPV can last for much longer than 2 months, in our opinion, it is better to treat it actively and be done with it rather than taking the wait/see approach. There are two treatments of BPPV that are usually performed in the doctor's office. Both treatments are very effective, with roughly an 80% cure rate, ( Herdman et al, 1993; Helminski et al, 2010). If your doctor is unfamiliar with these treatments, you can find a list of clinicians who have indicated that they are familiar with the maneuver from the Vestibular Disorders Association (VEDA) . The maneuvers, named after their inventors, are both intended to move debris or "ear rocks" out of the sensitive part of the ear (posterior canal) to a less sensitive location. Each maneuver takes about 15 minutes to complete. The Semont maneuver (also called the "liberatory" maneuver) involves a procedure whereby the patient is rapidly moved from lying on one side to lying on the other (Levrat et al, 2003). It is a brisk maneuver that is not currently favored in the United States, but it is 90% effective after 4 treatment sessions. In our opinion, it is equivalent to the Epley maneuver as the head orientation with respect to gravity is very similar, omitting only 'C' from the figure to the right. Because the head positions are the same, the results are the same. The Epley maneuver is also called the particle repositioning or canalith repositioning procedure. 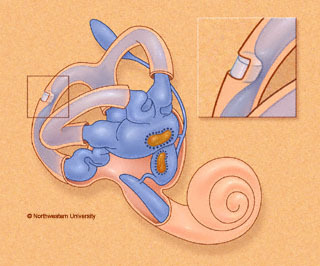 It was invented by Dr. John Epley, and is illustrated in figure 2 on the right (for the right ear). Click here for a low bandwidth animation. It involves sequential movement of the head into four positions, staying in each position for roughly 30 seconds. One starts (B) with the bad ear down -- for the left ear, one just mirrors the maneuver starting with the left ear down. The recurrence rate for BPPV after these maneuvers and resolution is about 22 percent at one year, and a second treatment (or more) may be necessary. When performing the Epley maneuver, caution is advised should neurological symptoms (for example, weakness, numbness, visual changes other than vertigo) occur. Occasionally such symptoms are caused by compression of the vertebral arteries (Sakaguchi et al, 2003), and if one persists for a long time, a stroke could occur. If the exercises are being performed without medical supervision, we advise stopping the exercises and consulting a physician. If the exercises are being supervised, given that the diagnosis of BPPV is well established, in most cases we modify the maneuver so that the positions are attained with body movements rather than head movements. Supplemental material : Animation of Epley Maneuver. Note that this maneuver is done faster in the animation than in the clinic. Usually one allows 30 seconds between positions. Also note that there are many "youtube" video's of the Epley as well as many other maneuvers, some of which are a little suspicious. The BPPV DVD referenced at the top of this page shows the standard procedure for the home-Epley as well as several other home BPPV treatments. 1. Wait for 10 minutes after the maneuver is performed before going home. This is to avoid "quick spins," or brief bursts of vertigo as debris repositions itself immediately after the maneuver. Don't drive yourself home. 2. Sleep semi-recumbent for the next night. This means sleep with your head halfway between being flat and upright (a 45 degree angle). 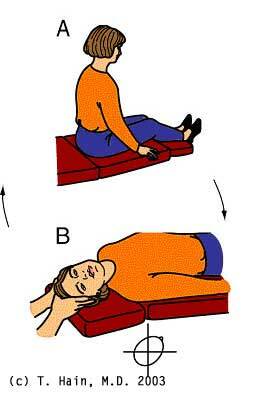 This is most easily done by using a recliner chair or by using pillows arranged on a couch (see figure to right). During the day, try to keep your head vertical. You must not go to the hairdresser or dentist for 24 hours. Shampoo only under the shower. There is some disagreement about the value of this procedure -- many authors suggest that no special sleeping positions are necessary (Cohen, 2004; Massoud and Ireland, 1996; Devaiah et al, 2010; Papacharalampous et al, 2012). We, as do others, think that there is value (Cakir et al, 2006). See this page for a literature review about post-maneuver restrictions. 3. For at least one week, avoid provoking head positions that might bring BPPV on again. Use two pillows when you sleep. Avoid sleeping on the "bad" side. Don't turn your head far up or far down. Be careful to avoid head-extended position, in which you are lying on your back, especially with your head turned towards the affected side. This means be cautious at the beauty parlor, dentist's office, and while undergoing minor surgery. Try to stay as upright as possible. Exercises for low-back pain should be stopped for a week. No "sit-ups" should be done for one week and no "crawl" swimming. (Breast stroke is OK.) Also avoid far head-forward positions such as might occur in certain exercises (i.e. touching the toes). Do not start doing the Brandt-Daroff exercises immediately or 2 days after the Epley or Semont maneuver, unless specifically instructed otherwise by your health care provider. Again, the value of post-maneuver restrictions is probably small, and it is also OK to just go about your life (but we think a little riskier). 4. At one week after treatment, put yourself in the position that usually makes you dizzy. Position yourself cautiously and under conditions in which you can't fall or hurt yourself. Let your doctor know how you did. While some authors advocate use of vibration in the Epley maneuver, we have not found this useful in a study of our patients (Hain et al, 2000). There is some rationale for its use in cupulolithasis or refractory BPPV. Use of an antiemetic prior to the maneuver may be helpful if nausea is anticipated. Some authors suggest that position 'D' in the figure is not necessary (e.g. Cohen et al. 1999; Cohen et al. 2004 ). In our opinion, this is a mistake as mathematical modeling of BPPV suggests that position 'D' is the most important position (Squires et al, 2004). Mathematical modeling also suggests that position 'C' is probably not needed. In our opinion, position 'C' has utility as it gives patients a chance to regroup between position 'B' and 'D'. The "Gans" maneuver. This is a little used treatment maneuver, called the "Gans maneuver" by its inventor (R. Gans, Ph.D.), that is a hybrid between the Epley and Semont maneuvers. It incorporates the head orientations to gravity of "B" and "D" in the Epley figure above, using the body positions of the Semont maneuver. It leaves out position 'C' in the figure above. There is too little published experience with this maneuver to say whether it is as effective as the Epley/Semont but we suspect that it has the same efficacy, as it uses the same head orientations with respect to gravity. WHAT IS THE PROOF THAT THE EPLEY/SEMONT MANEUVERS WORK ? Many patients have been reported in controlled studies. The median response in treated patients was 81%, compared to 37.% in placebo or untreated subjects. A metanalysis published in 2010 indicated that there is very good evidence that the Epley maneuver (CRP) is effective (Helminski et al, 2010). See here for the details. WHAT IF THE MANEUVERS FOR BPPV DON'T WORK? While the Epley maneuver works roughly 50-75% of the time on the first occasion they are used, this means the other 25% are either not "fixed", or just partially better, or perhaps even worse (about 5%). For this reason, in persons who have continued dizziness, a follow-up visit is scheduled and another nystagmus test with video-Frenzel goggles is done. It is common to have a follow-up visit once/week for roughly a month. It does not appear that the reason for BPPV -- idiopathic vs. trauma -- affects the symptom resolution rate (Aron et al, 2015). Bizarrely, some insurance companies, in what we consider a misguided attempt to save money, suggest that positional nystagmus tests for dizziness that guide treatment once/week are "too frequent". This is in spite of reports that it often takes a few visits to treat BPPV (Hughes et al, 2016). This insurance company logic is seriously flawed. Just imagine -- what if insurance companies tried to save money by limiting the number of EKG's that can be done in a person with a heart attack ? Insurance would pay less but more people would die. With BPPV, one needs to see the results of the last treatment, and be sure that things haven't changed. Similarly, it would be ridiculous to prevent a cardiologist from checking an EKG on a patient who had sustained a heart attack, but was not in chest pain. You can see how this logic applies to follow-up testing for BPPV. The office maneuvers for BPPV, perhaps provided on 2 or 3 occasions, are effective in 85-95% of patients with BPPV. If you are among the other remainder, or your symptoms are mild enough that the trouble of travelling is more than it is worth, or you live far away, your doctor may wish you to proceed with the home Epley exercises, as described below. If a maneuver works but symptoms recur or the response is only partial (about 40% of the time according to Smouha, 1997), another trial of the maneuver might be advised. When all maneuvers have been tried, the diagnosis is clear, and symptoms are still intolerable, surgical management (posterior canal plugging) may be offered. This is exceedingly rare. Occasional patients travel to a facility where a device is available to position the head and body to make the maneuvers more effective. See this page for more information about this option. As one can usually get to any position through moving the head and body around, unless you are very unwieldy, these devices are likely an "overkill". BPPV often recurs. About 1/3 of patients have a recurrence in the first year after treatment, and by five years, about half of all patients have a recurrence (Hain et al, 2000; Nunez et al; 2000; Sakaida et al, 2003). If BPPV recurs, in our practice we usually re-treat with one of the maneuvers above. While daily use of exercises would seem sensible, we did not find it to prevent recurrence (Helminski et al, 2005; Helminski and Hain, 2008). There are many home maneuvers for the most common type of BPPV (Posterior canal). There are so many home maneuvers that we wrote a separate page to describe them. The frequency of surgical treatment has been dropping rapidly in favor of other treatments (Leveque et al, 2007). Only about 1/200 our BPPV patients eventually have this procedure done. We have not had any patients go for surgery for at least 5 years. Surgery should not be considered until all three maneuvers/exercises (Office Epley, Office Semont, Home Epley) have been attempted and failed. Surgical treatment of BPPV is not easy -- your local ear doctor will probably have had no experience at all with this operation. Of course, it is always advisable when planning surgery to select a surgeon who has had as wide an experience as possible. Complications are rare (Rizvi and Gauthier, 2002), but nevertheless one should still think carefully about undergoing a procedure that has a 3% risk of unilateral hearing loss. If the exercises described above are ineffective in controlling symptoms, symptoms have persisted for a year or longer, and the diagnosis is very clear, a surgical procedure called "posterior canal plugging" may be recommended. Canal plugging blocks most of the posterior canal's function without affecting the functions of the other canals or parts of the ear. This procedure poses a substantial risk to hearing -- ranging from 3-20%, but is effective in about 85-90% of individuals who have had no response to any other treatment (Shaia et al, 2006; Ahmed et al, 2012). The risk of the surgery to hearing derives from inadvertent breaking into the endolymphatic compartment while attempting to open the bony labyrinth with a drill. Sensibly, canal plugging for BPPV (note the first letter stands for "benign") is rarely undertaken these days due to the risk to hearing. Singular nerve section is the main alternative. Dr Gacek (Syracuse, New York) has written extensively about singular nerve section (Gacek et al, 1995). Interestingly, Dr. Gacek is the only surgeon who has published any results with this procedure post 1993 (Leveque et al, 2007). Singular nerve section is very difficult because it can be hard to find the singular nerve. Dr. Anthony (Houston, Texas), advocates laser assisted posterior canal plugging. It seems to us that these procedures, which require unusual amounts of surgical skill, have little advantage over a conventional canal plugging procedure. There are several surgical procedures that we feel are simply inadvisable for the individual with intractable BPPV. 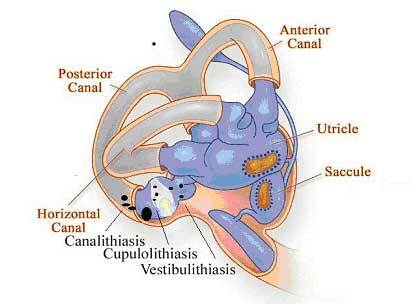 Vestibular nerve section, while effective, eliminates more of the normal vestibular system than is necessary. Similarly, transtympanic gentamicin treatment is generally inappropriate. Labyrinthectomy and sacculotomy are also both inappropriate because of reduction or loss of hearing expected with these procedures. Singular nerve section appears to be too difficult for most otologic surgeons. There are several rarer variants of BPPV which may occur spontaneously as well as after the Brandt-Daroff maneuvers or Epley/Semont maneuvers. They are mainly thought to be caused by migration of otoconial debris into canals other than the posterior canal, such as the anterior or lateral canal. Debris may also migrate into or out of the short arm of the PC (on diagram, where arrow says "vestibulolithiasis"). It is also possible that some are due to other conditions such as brainstem or cerebellar damage, but clinical experience suggests that this is very rare. There is presently no data reported as to the frequency and extent of these syndromes following treatment procedures. It is the author's estimate that they occur in roughly 5% of Epley maneuvers. In nearly all instances, with the exception of cupulolithiasis, these variants of BPPV following maneuvers resolve within a week without any special treatment, but when they do not, there are procedures available to treat them. It is especially common to have supine downbeating nystagmus after a successful Epley maneuver (Cambi et al, 2012). This should not be of any concern as long as it is unaccompanied by upbeating nystagmus on sitting (which suggests anterior canal BPPV). Cupulolithiasis is a condition in which debris is stuck to the cupula of a semicircular canal, rather than being loose within the canal. Cupulolithiasis should result in a constant nystagmus. This pattern is sometimes seen (Smouha et al. 1995). Cupulolithiasis might theoretically occur in any canal -- horizontal, anterior or vertical, each of which might have it's own pattern of positional nystagmus. If cupulolithiasis of the posterior canal is suspected, it seems logical to treat with either the Epley with vibration, or alternatively, use the Semont maneuver. Other maneuvers have been proposed for lateral canal cupulolithiasis. There are no controlled studies of cupulolithiasis to indicate which strategy is the most effective. Vestibulolithiasis is a hypothetical condition in which debris is present on the vestibule-side of the cupula, rather than being on the canal side. For this theory, there is loose debris, close to but unattached to the cupula of the posterior canal, possibly in the vestibule or short arm of the semicircular canal. This mechanism would be expected to resemble cupulolithiasis, having a persistent upbeating nystagmus, but with intermittency because the debris is movable. Very little data is available as to the frequency of this pattern, and no data is available regarding treatment. Multicanal BPPV. If debris can get into one canal, why shouldn't it be able to get into more than one ? It is common to find small amounts of horizontal nystagmus or contralateral downbeating nystagmus in a person with classic posterior canal BPPV. While other explanations are possible, the most likely one is that there is debris in multiple canals. Gradually a literature is developing about these situations (Bertholon et al, 2005). The response to physical therapy based treatment for multi-canal BPPV is lower than single-canal BPPV (Song et al, 2015). WHERE ARE BPPV EVALUATIONS AND TREATMENTS DONE? The Vestibular Disorders Association (VEDA) maintains a list of doctors, audiologists and physical therapists who claim that they have proficiency in treating BPPV. This is one way to a local treating health care provider interested in treating this condition. We think it is best to select someone who treats BPPV at least on a weekly basis, or if this is not possible, someone who has attended a course on vestibular rehabilitation AND who has the equipment in their office to visualize BPPV (i.e. Frenzel goggles). Because BPPV is so common, most major cities will have at least one person who fits these minimal criteria. Of course, someone who treats BPPV and similar conditions as their main work activity is best. These people are usually called "vestibular physical therapists" or VPT. If a physical therapist gives you Brandt-Daroff maneuvers to do, or puts their main emphasis on treatment of neck mobility -- they are probably not very knowledgable about BPPV. Ahmed RM, Pohl DV, MacDougall HG, Makeham T, Halmagyi GM.Posterior semicircular canal occlusion for intractable benign positional vertigo: outcome in 55 ears in 53 patients operated upon over 20 years. J Laryngol Otol. 2012 Jul;126(7):677-82. doi: 10.1017/S0022215112000758. Epub 2012 May 15. Aron M, Lea J, Nakku D, Westerberg BD.Symptom Resolution Rates of Posttraumatic versus Nontraumatic Benign Paroxysmal Positional Vertigo: A Systematic Review. Otolaryngol Head Neck Surg. 2015 Nov;153(5):721-30. doi: 10.1177/0194599815594384. Epub 2015 Jul 16. ATACAN E, Sennaroglu L, Genc A, Kaya S. Benign paroxysmal positional vertigo after stapedectomy. Laryngoscope 2001; 111: 1257-9. Balatsouras DG, Ganelis P, Aspris A, Economou NC, Moukos A, Koukoutsis G. Benign paroxysmal positional vertigo associated with Meniere's disease: epidemiological, pathophysiologic, clinical, and therapeutic aspects. Ann Otol Rhinol Laryngol. 2012 Oct;121(10):682-8. BERTHOLON P, Chelikh L, Tringali S, Timoshenko A, et al. Combined horizontal and posterior canal benign paroxysmal positional vertigo in three patients with head trauma. Ann Otol Rhinol Laryngol 2005;114:105-10. Brandt T, Daroff RB. Physical therapy for benign paroxysmal positional vertigo. Arch Otolaryngol 1980 Aug;106(8):484-485. Brandt T, Steddin S, Daroff RB. Therapy for benign paroxysmal positioning vertigo, revisited. Neurology 1994 May;44(5):796-800. Cohen, H. S., et al. (1999). "Efficacy of treatments for posterior canal benign paroxysmal positional vertigo." Laryngoscope 109(4): 584-90. Cohen, H. S., et al. (2004). "Treatment variations on the Epley maneuver for benign paroxysmal positional vertigo." Am J Otolaryngol 25(1): 33-7. Devaiah, A. K. and S. Andreoli (2010). "Postmaneuver restrictions in benign paroxysmal positional vertigo: an individual patient data meta-analysis." Otolaryngol Head Neck Surg 142(2): 155-159. Dispenza F, De Stefano A, Mathur N, Croce A, Gallina S. Benign paroxysmal positional vertigo following whiplash injury: a myth or a reality? .Am J Otolaryngol. 2011 Sep-Oct;32(5):376-80. Epub 2010 Sep 15. Fife TD. Recognition and management of horizontal canal benign positional vertigo. Am J Otol 1998 May;19(3):345-351. Froehling DA, Silverstein MD, Mohr DN, Beatty CW, Offord KP, Ballard DJ. Benign positional vertigo: incidence and prognosis in a population-based study in Olmsted County, Minnesota. Mayo Clin Proc 1991 Jun;66(6):596-601. Furman, J. M. and T. C. Hain (2004). ""Do try this at home": self-treatment of BPPV." Neurology63(1): 8-9. Hain, T. C., T. M. Squires and H. A. Stone (2005). "Clinical implications of a mathematical model of benign paroxysmal positional vertigo." Ann N Y Acad Sci1039: 384-94. Harvey SA, Hain TC, Adamiec LC. Modified liberatory maneuver: effective treatment for benign paroxysmal positional vertigo. Laryngoscope 1994 Oct;104(10):1206-1212. Helminski, J. O., I. Janssen, D. Kotaspouikis, et al. (2005). "Strategies to prevent recurrence of benign paroxysmal positional vertigo." Arch Otolaryngol Head Neck Surg131(4): 344-8. Herdman SJ. Treatment of benign paroxysmal vertigo. Phys Ther 1990 Jun;70(6):381-388. Herdman SJ, Tusa RJ, Zee DS, Proctor LR, Mattox DE. Single treatment approaches to benign paroxysmal positional vertigo. Arch Otolaryngol Head Neck Surg 1993 Apr;119(4):450-454. Hong SM and others. Subjective visual vertical during eccentric rotation in patients with benign paroxysmal positional Vertigo. Otology and Neurology, 2008. 1167-1170. Hornibrook, J. (2004). "Horizontal canal benign positional vertigo." Ann Otol Rhinol Laryngol113(9): 721-5. Lanska DJ, Remler B. Benign paroxysmal positioning vertigo: classic descriptions, origins of the provocative positioning technique, and conceptual developments. Neurology 1997 May;48(5):1167-1177. Lempert T, Wolsley C, Davies R, Gresty MA, Bronstein AM. Three hundred sixty-degree rotation of the posterior semicircular canal for treatment of benign positional vertigo: a placebo-controlled trial. Neurology 1997 Sep;49(3):729-733. Li, J. C. (1995). "Mastoid oscillation: a critical factor for success in canalith repositioning procedure." Otolaryngol Head Neck Surg112(6): 670-5. Lynn, S., A. Pool, et al. (1995). "Randomized trial of the canalith repositioning procedure." Otolaryngol Head Neck Surg113(6): 712-20. Neuhauser, H. K. and T. Lempert (2009). "Vertigo: epidemiologic aspects." Semin Neurol 29(5): 473-481. Papacharalampous, G. X., et al. (2012). "The Role of Postural Restrictions after BPPV Treatment: Real Effect on Successful Treatment and BPPV's Recurrence Rates." Int J Otolaryngol 2012: 932847. Parnes LS, McClure JA. Posterior semicircular canal occlusion for intractable benign paroxysmal positional vertigo. Ann Otol Rhinol Laryngol 1990 May;99(5 Pt 1):330-334. Parnes LS. Update on posterior canal occlusion for benign paroxysmal positional vertigo. Otolaryngol Clin North Am 1996 Apr;29(2):333-342. Parnes LS, Price-Jones RG. Particle repositioning maneuver for benign paroxysmal positional vertigo. Ann Otol Rhinol Laryngol 1993 May;102(5):325-331. Rojas-Burke J. Doctor and invention outlast jeers and threats. The Oregonian. Dec 31, 2006 (Article about Dr. John Epley -- pdf available). Semont A, Freyss G, Vitte E. Curing the BPPV with a liberatory maneuver. Adv Otorhinolaryngol 1988;42:290-293. Shaia WT, Zappia JJ, Bojrab DI, LaRouere ML, Sargent EW, Diaz RC. Success of posterior semicircular canal occlusion and application of the dizziness handicap inventory. Otolaryngol Head Neck Surg. 2006 Mar;134(3):424-30. Song CI1, Kang BC, Yoo MH, Chung JW, Yoon TH, Park HJ. Management of 210 patients with benign paroxysmal positional vertigo: AMC protocol and outcomes. Acta Otolaryngol. 2015 May;135(5):422-8. doi: 10.3109/00016489.2014.993089. Epub 2015 Feb 13. Squires TM, Weidman MS, Hain TC, Stone HA. A mathematical model for top-shelf vertigo: the role of sedimenting otoconia in BPPV. J Biomech, 2004. 37(8): p. 1137-46. Welling DB, Barnes DE. 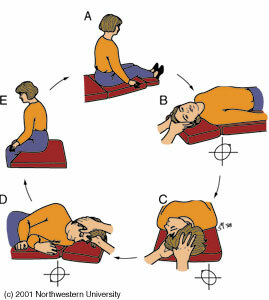 Particle Repositioning maneuver for benign paroxysmal positional vertigo. Laryngoscope 1994 Aug;104(8 Pt 1):946-949. Click here for recent, but possibly less relevant references.